Go to any personal finance blog and the number one tip you’ll find for helping you to manage your money better is to set a budget. Budgets are great, but what happens if you don’t live on a fixed income? Building a budget becomes exponentially harder when you aren’t 100% sure how much money you’ll bring in every month. I work as a freelance writer, so my income can vary tremendously. One month I can make a thousand dollars more than the month prior, or maybe hundreds less than the month before. Even my husband, who works as a police officer, has an unsteady income. Long hours and days of overtime are a realistic part of his job description. It always seems like the moment we start to rely on overtime checks, his hours drop off dramatically. However, an irregular income shouldn’t hold you back from managing your money properly. What started out as a royal pain has actually become a valuable life lesson in personal finance. Our erratic income has taught us how to budget under “feast or famine” conditions. We have learned that when you depend on an erratic income to pay the bills, you have to set your budget to reflect the uncertainty in those numbers. Budgeting with a feast or famine income is definitely more difficult, but it’s not impossible. 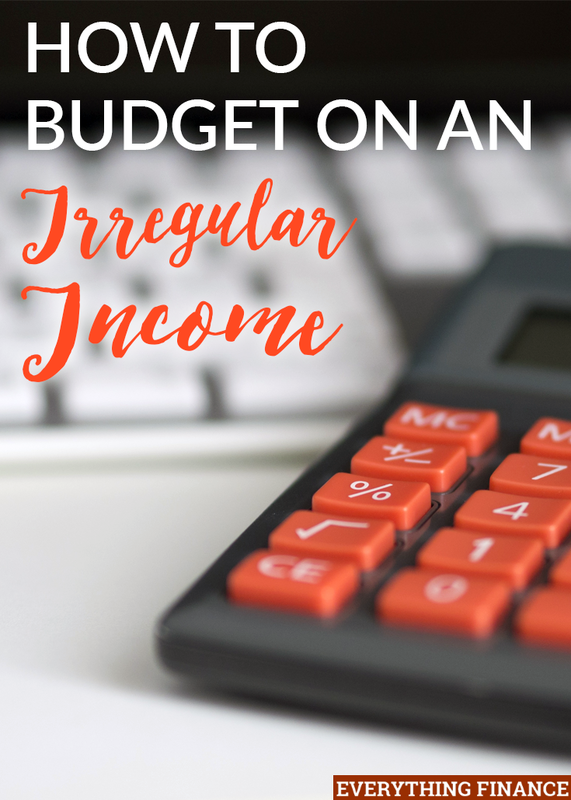 If you struggle with how to manage an irregular income, these budgeting ideas may help you. Your income may be irregular, but your bills won’t be. Pull out all of your bank statements for at least the past three months to find the average of how much you brought in and how much went out. Accounting for where your money goes each month is the first step to building a budget. How much do you spend on your rent or mortgage? How much do you pay for car, house, and medical insurance each month? What do you usually spend on groceries, gas, and miscellaneous home items like toilet paper and toothpaste? Calculate the minimum number it would take for you to balance your home and health; everything else is extra. Now that you know the bare minimum amount you need to stay afloat each month, when you do get paid, pay those necessary bills first, pull out cash for groceries and gas to last the month, and put the rest into a separate account. If you build up a reserve of cash from your “feast” months, you’ll have funds to rely on during the “famine” months. I’m not going to lie, not going crazy on pay day is challenging, especially if you get a large paycheck right after famine month. When you see that big number sitting in your checking account, it’s easy to feel like you can afford things you normally don’t have room in the budget for, like going out to eat. Resist that urge to spend. You won’t have money to set aside in your separate account for famine months if you spend excessively on unnecessary things. By all means, enjoy a night of take out, but don’t make it a habit that will drain your account to zero. You don’t want to be left scrambling with not enough money in the coming months. When we were first struggling to make ends meet on an uncertain income, we decided to strip our spending down to a bare-bones budget. We reduced our cell-phone bill, got rid of cable, and decided to make do with less on several of our services (like home security and insurance). We quickly learned that living with less makes saving more easy to do. When you go into frugal mode by default, you aren’t tempted to spend money on things you don’t need as saving money becomes an ingrained habit. When you save more, you widen the gap between your minimum monthly budget and how much you have to spend during your famine months. If you’re saving money during your feast months, you’ve cut out unnecessary bills, and you still have trouble finding enough money to pay the bills in your famine months, it’s time to bring in more income. Luckily, as a freelance writer, it’s fairly easy to pick up more work, find more assignments, and bring in more income. My husband can also say yes to more overtime jobs if absolutely necessary. You can bring in more money even if you don’t have overtime or extra assignments available to you. Picking up a side hustle is a great way to bring in extra income and pad your bank account for when you need to rely on savings to get you through the next month. If you’re great at writing, you could become a freelance writer, too. If you love graphic design, market your services to websites and bloggers. Are you great at organization and secretarial skills? You could become a part time virtual assistant for businesses and websites. Find a way to monetize whatever it is that you’re good at doing. Having that extra income will not only make the famine months easier, but you could also make them disappear entirely. By setting a bare bones budget and living frugally no matter how much income you bring in, it will make it a lot easier to save through the feast months and make it through the famine months. If you cut your budget as much as possible, save as much as possible, and bring in more income with a side hustle or other opportunities, you’ll be able to make an irregular income work for your family. Do you live on a feast or famine income? What is your advice to people struggling to make a budget? Have you taken these steps to live off of irregular income? Budgeting is really important not just when you have irregular income but every day. This process will help you prioritize the things that are essentials and will able you to save more spend less.